Printed in the U Matuna, the newspaper for the Archdiocese of Agana, Guam, October 9, 2011. October 7 is the Feast of Our Lady of the Most Holy Rosary. The feast was originally instituted by Pope Pius V as the Feast of Our Lady of Victory to commemorate the victory of the Christian forces over the Ottomans at the Battle of Lepanto in 1571. 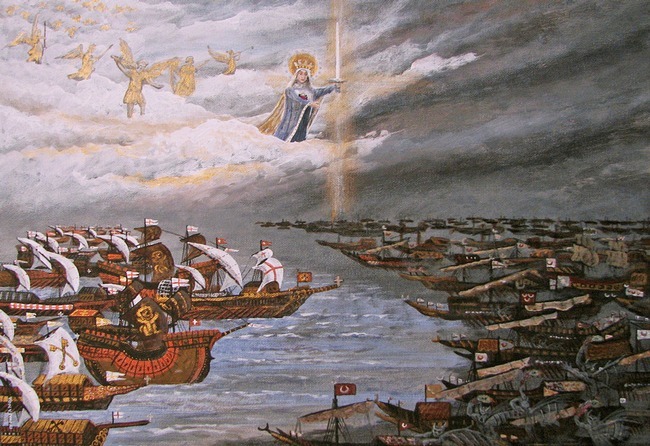 Lepanto was more than just another battle. For nearly 800 years Christian civilizations within an ever expanding Islamic radius had been falling to the Saracen sword. A loss at Lepanto could have meant the subjagation of Christian Europe, and with it, the destruction of western civilization. With the Christian forces greatly outnumbered, Pius V invoked the intercession of the Mother of God through the Most Holy Rosary. The Christians not only miraculously won the battle, but effectively stalled the march of the “Mohammedan” and secured Europe for the first time in 800 years. But there was no Lepanto-life victory for Bishop Finn. Not only did the pro-abortion team of Obama-Biden take the White House, but pro-abortion majorities also swept both houses of Congress. And with at least two Supreme Court justices about to retire, the appointment and confirmation of their pro-abortion replacements was guaranteed. It was a grand slam. All three branches of government would be solidly pro-abortion in 2009. The news within the pro-life community was glum. The hard work of turning back the tide of abortion one mother and one law at a time seemed all for naught. Throughout 2009 and into 2010 the mood darkened as the new administration aggressively implemented its anti-life agenda. Indeed, within 48 hours of his inauguration, the new President lifted the Mexico City Policy allowing millions of U.S. dollars to be sent oversees to fund abortions in developing nations. And with the pro-abortion health care bill poised to pass in March of 2010, prospects for the legal protection of nascent human life appeared very grim. However, it seems that the Blessed Mother had a little something up her sleeve. While Bishop Finn’s prayers were not answered in 2008, they appeared to be answered in 2010. The 2010 mid-term election swept more pro-life lawmakers into office on both the state and national levels than ever before, and the chart below tells the story. In just the first six months of 2011, 162 pro-life provisions were enacted at the state level, triple the number from the previous year! In state after state, abortion proponents are now scrambling to stop the pro-life juggernaut that is sweeping the nation, that is, sweeping the nation in just about ever place except Guam.